St Michael & All Angels, Horsenden, stands adjacent to the grounds of Horsenden Manor. There has been a church on this site since at least 1210, although the present church is part of a larger 15th century building. There were a few subsequent alterations: in 1765, the nave and the west tower were demolished and the present tower built (it contains a bell dated 1582); and in the late 19th century, the chancel was extended 8ft to the east. Inside, a 16th c screen separates the chancel from the nave, with 14thc patterned tiles, almost certainly made near Penn, on the floor. Either side of the altar there are remarkable Victorian tiles depicting an eagle with the head of a calf and vice versa. The stained glass in the south windows (right), regarded as some of the best of its period (1900), is by Westlake. Horsenden occupies an important footnote in history: Edward Stone, Rector from 1737 (and related by marriage to the Grubbe family, see the History page), discovered that chewing willow bark helped his rheumatism, and reported this to the Royal Society in 1763. The active ingredient was later shown to be salicylic acid or aspirin. Stone, a keen amateur scientist, also wrote scholarly papers on astronomical parallaxes. 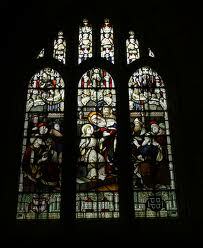 He later served in various parishes around Chipping Norton, but was, at his own request, buried in Horsenden. The key–holders are listed on the church notice board. Prayer Book Matins is held here every 4th Sunday at 9:00am. If you would like to help with flower arranging or church cleaning please contact Janet Robson, 01844 343015, who would be delighted to hear from you.